Almost every day these colorful little mail-outs arrive for my son. He’s never gotten so much mail before. He gets more mail than anyone else. 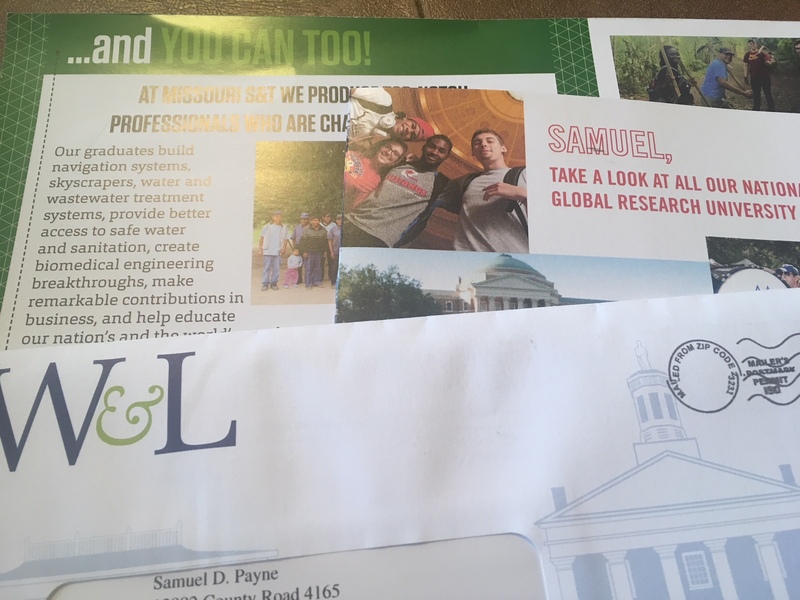 Because he’s halfway through his junior year, and the colleges all want our money. The first time one of these little colorful cards arrived in the mail maybe two years ago or so, I remember being in shock myself but how excited he was. To get mail. To be “wanted” by a college. When in reality, it was probably just that somehow he got on some list a little early. Now it’s such a normal occurrence that we hardly bat an eye. But here’s what does happen every time I get the mail. Something happens inside me. They’re chipping away at me. These little cards from colleges all over the United States are slowly one-by-one chipping away at me. Denial stayed around a while. Then by several weeks of little cards, there was a twinge of reality. Then after months, there was more chipping away. We were getting into the painful place where it hurt more. Now the cards just hurt. Getting the mail just seemed to cut me. But lately I’ve noticed it hurts not as much. There’s a wound there for sure. It’s opened but it’s numbing up. I’m starting to feel more numbness than pain. I’m getting used to the idea of what is coming. And slowly, as these little cards lead my heart through time and through the process, I realize that they are part of preparing me. When the day comes, I know I’ll be ready. And I wonder how much of it will be from the feelings, the thoughts and emotions that went on each day when I got the mail.